Expendable news item here only worthy of a Friday post. For those who may have missed it, VMware has released an update to the vSphere Management Assistant (vMA) 5.1 appliance formally referred to as Patch 1. This release is documented in VMware KB 2044135 and the updated appliance bits can be downloaded here. Log in, choose the VMware vSphere link, then the Drivers & Tools tab. The base operating system is updated to SUSE Linux Enterprise Server 11 SP2 (12-Jan-2013). JRE is updated to JRE 1.6.0_41, which includes several critical fixes. VMware Tools is updated to 8.3.17 (build 870839). A resxtop connection failure issue has been fixed. HTTPS_CA_FILE or HTTPS_CA_DIR not set. This issue is fixed through this patch. When you invoke the VMware Tools installation via the vSphere Client, you may encounter the error “A general system error occurred: Internal error“. 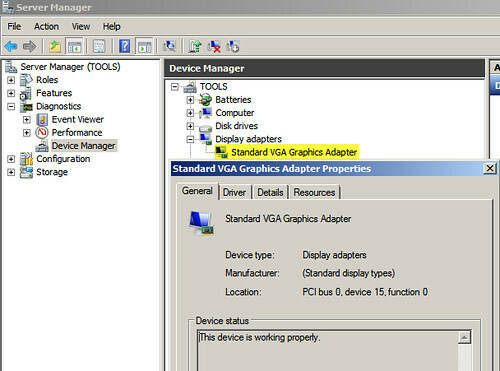 One thing to check is that the VM shell has the correct operating system selected for the guest operating system type. For example, a setting of “Other (32-bit)” will cause the error since VMware cannot determine the correct version of the tools to install in the guest operating system because the flavor of guest operating system is unknown (ie. Windows or Linux). The virtual machine has CD-ROM configured. 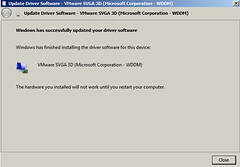 The windows.iso is present under the /vmimages/tools-iso/ folder. The correct guest operating system selected. For example, if the guest operating system is Windows 200, ensure you have chosen Windows 2000 and not Other. 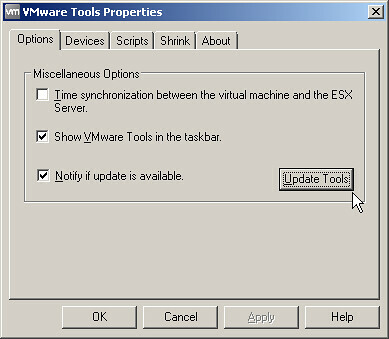 VMware introduced the VMware Descheduled Time Accounting Service as a new VMware Tools component in ESX 3.0. The goal was to account for inconsistent CPU cycles allocated to the guest VM by the VMkernel to provide accurate performance statistics using standard performance monitoring tools within the guest VM. Although the service was not installed and enabled with VMware Tools by default, nor did it ever escape the bonds of experimental support status, I found the service to be both stable and reliable and it was a standard installation component in one of my production datacenters. One caveat was that the service only supported uniprocessor guest VMs having a single vCPU. Did you notice the explicit statement about Perfmon? Perfmon is Microsoft Windows Performance Monitor or perfmon.exe for short. Whereas the legacy VMware Descheduled Time Accounting Service supported both Windows and Linux guest VMs, its successor currently supports Perfmon ala Windows guest VMs only. It seems we’ve gone backwards in functionality from a Linux guest VM perspective. Another pie in the face for shops with Linux guest VMs. I understand that Windows guest VMs are the low hanging fruit for software development and features, but VMware needs to make sure some love is spread through the land of Linux as well. Folks with Linux shops are still struggling with basic concepts such as Linux guest customization as well as flexibility and automation of VMware Tools installation in the Linux guest OS. If VMware is going to tout their support for Linux guest VMs, I’d like to see more of a commitment than what is currently being offered. There’s more to owning a virtualized infrastructure than powering on instances on top of a hypervisor. Building it is the easy part. Managing it can be much more difficult without the right tools. Flexibility and ease with in the management tools is critical, especially as virtual infrastructures grow. Observing some of the counter names, it’s interesting to see that VMware has given us direct insight into the hypervisor resource configuration settings via Performance Monitor from inside the guest VM. While this may be useful for VI Administrators who manage both the VI as well as the guest operating systems, it may be disservice to VI Administrators in environments where guest OS administration is delegated to another support group. The reason why I say this is that some of these new counters disclose an “over commit” or “thin provisioning” of virtual hardware resources which I’d rather not reveal to other supports groups. What they don’t know won’t hurt them. Revealing some of the tools in our bag of virtualization tricks may bring about difficult discussions we don’t really want to get into or perhaps provoke the finger of blame to be perpetually pointed in our direction whenever a guest OS problem is encountered. I’ve grabbed a few screen shots from my lab which show the disparity between native Perfmon metrics and the new vSphere Virtual Machine Performance Counters. 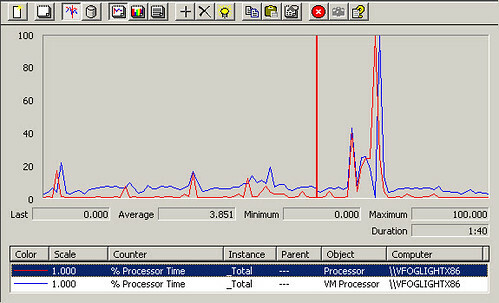 In this example, I compare %Processor Time from the Perfmon native Processor object against the %Processor Time from the VM Processor object which was injected into the VM during the vSphere VMware Tools installation. It’s interesting to note, and you should be able to clearly see it in the graph, that the VM Processor %Processor time is consistently double that of the Perfmon native Processor % Processor Time counter. Consider this when you are providing performance information for a guest VM or one of its applications. If you choose the native Perfmon counter, you could be reporting performance data with 100% margin of error as shown in the case below. This is significant and if used for capacity planning purposes could lead to all sorts of problems. One other important item to note is that you may recall I said towards the beginning that the legacy VMware Descheduled Time Accounting Service only supported uniprocessor VMs. The same appears to be true for the new vSphere Virtual Machine Performance Counters. In the lab I took a single CPU VM which had the vSphere Virtual Machine Performance Counters, and I adjusted the vCPU count to 4. After powering on with the new vCPU count, the vSphere Virtual Machine Performance Counters disappeared from the pulldown list. VMware needs to address this shortcoming. Performance statistics on vSMP VMs are just as important, if not more important, than performance statistics on uniprocessor VMs. vSMP VM resource utilization needs to be watched more closely for vSMP justification purposes. I read your recent blog post on the Perfmon integration in vSphere 4.0. I’m the product manager for the feature and wanted to reach out to on your findings and feedback regarding the feature. We’ve deprecated vmdesched in vSphere 4.0 because it was primarily an experimental feature that we didn’t recommend putting in production. More importantly, vmdesched adds overhead to the guest and is not compatible with some of the newer kernels out there and so the Perfmon integration is our answer to improve on the current state and provide accurate CPU accounting to VM owners that can be deployed in production and is integrated well with VMware Tools for out-of-box functionality. The Perfmon integration in vSphere 4.0 leverages the guest SDK API to get to the accurate counters from the hypervisor and that is available on Linux GOS as well. All you need is to have the VMware Tools installed to get access to the guest SDK interface. We couldn’t provide something like Perfmon on Linux since there aren’t many broadly used tools/APIs that we can standardize on. There are some discussions internally to solve the accounting issue on Linux guests in a much simplified manner but I can’t go into the specific details at this time. Rest assured, I can tell you that we are looking into the problem for Linux workloads. So for Linux guests, you can refer to the guest SDK documentation on how someone can modify their Linux agents, tools etc. to talk to the “accurate” counters. The programming guide for vSphere guest SDK 4.0 is available at http://www.vmware.com/support/developer/guest-sdk/. The list of available perf counters is in Page 11 of the PDF (Accessor functions for VM data). You can in fact use the older 3.5 version of the guest SDK API as well if you want to implement something that works with existing VI3 environments (yes, this SDK has been around for a while!). The only difference is that the vSphere version of the API has a few extra counters but you will get access to the important counters such as CPU utilization in the older API itself. I’m really surprised with your observations after moving to a 4 vCPUs. 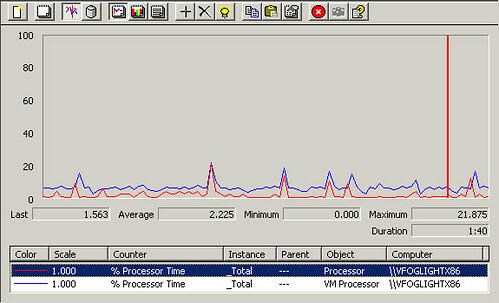 Not sure what’s going on but AFAIK, we report the _Total (aggregate) of all CPU utilization in one metric in the “VM Processor” counter group in Perfmon. What that means is regardless of how many CPUs in-guest, we do provide the _Total of CPU Utilization. Maybe you may have run into a bug. I’ll check with engineering on this anyways to confirm my understanding. So to help us investigate this, could you please do the following? b. if you have the 3.5 version of VMware tools running on a VI3 setup, download the standalone version of the Perfmon tool and install it on a Windows VM and check if the 4-vCPU problem is observed. I haven’t tested the same standalone version of Perfmon on a vSphere 4.0 setup (with 4.0 version of the tools) but I wouldn’t be surprised if the standalone version does work. 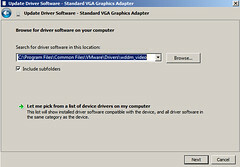 You may want to snapshot the VM before you attempt this though so you can rollback. Importantly, other counters when measured inside the guest such as Memory, Disk and Network don’t really suffer from accounting problems (i.e. they are accurate) as compared to CPU utilization numbers captured over a period of time (which may be accounted different due to the scheduling and de-scheduling the hypervisor does). 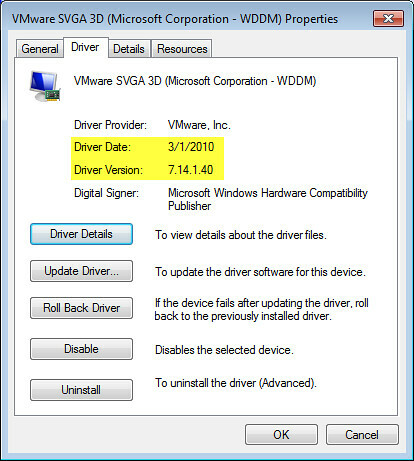 So the numbers for Disk, Memory and Network when captured inside the Windows guest will be the same as the VI client. However, I do recognize that as more and more customers start using this integration, there will soon be a need for providing disk and network counters as well. This is definitely on my radar to address in a future release. Hope the information I provided helps in better understanding the Perfmon integration in vSphere 4.0 and also answer some of your questions in the blog post. Looking forward to your findings with the 4 vCPU VMs. LMK if you have any questions in the interim. not available thus the counters (including _Total) were not available. Today, I deployed a 1 vCPU Windows Server 2003 VM from a 1 vCPU template. Following that, I encountered more problems. 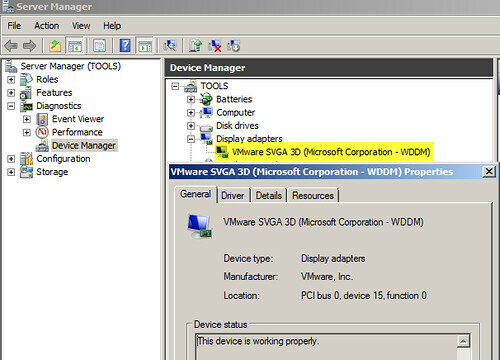 I was able to choose the VM Processor object, but the counters for the object were all missing. Definitely a bug somewhere with these. Please advise.